How do you animate a texture change? I am trying to animate a figure transforming. I'm starting with a Hulk transformation from a basic male genesis form into the Hulk by increasing the Mr. Hyde character morph later in the timeline. The changing from human shape to Hulk shape works, but I cannot figure out how to get the figure to transform from the human texture [I'm using Elite Sol] to a green "Hulk-like" texture. Whether I use the Hyde texture for the end frame, or just "green out" the Sol texture at the end frame, the change reverts back to the first frame so there is no "pink human to green Hulk" transformation. Is there a way to transform the texture in the DS4 animation? Not using the standard shaders, but if you go into Shader Mixer the Variable brick does give you access to the time, which you could use to control a texture or colour shift. Funny, I had bought that product for a different purpose when it was on sale recently only to discover that it didn't work in DS4 so I returned it. Thanks for the thought, though. Thanks Richard. I have never opened up the Shader Mixer before, and can't quite locate the "Variable brick" but I will poke around for some tutorials on it. Thanks for pointing me in this directions. I don't think Animated textures would do what you wanted even if it did work in DS4 - what it does is add an image sequence to a surface, iterating through it as the render proceeds. That's great for things like fire, but in your case it would mean having a separate image for each stage of the transition which is not, I would think, what you want. The Variable brick, at least in DS4.5, is under the Utility group. Here's an idiotically simple example -I just divided the frame number by 30 and plugged that into a Mix brick (under Mathematical) to switch between white and green. I think for changing colors it can be done with the variable brick. I'm not sure if Casual scripts work on figures or only on props though, do they work on figures? I wonder if there is a way to animate a change in displacement stregth or even better normal map strength for popping veins. Or a way to animate the texture for a fighter getting a blade cut or a drop of water rolling down the skin. I could really use some of those features. Take a look at MatAnim, Simon - the script works on Surfaces, so it doesn't matter whether it's a figure or a prop. You can animate displacement strength, opacity - anything that's on the Surfaces tab. (Not sure about normal map.) I've found that you do have to keep track of what's happening, because keyframes don't show up anywhere, but it's still a good solution. Of course in DS3, there's Geppetto, where you can animate materials with keyframes. For a drop of water rolling down the skin, I'm not sure. Setting that up as a series of animated textures would be a pain. I wonder if actually modelling a drop of water and animating that might be better. Is the variable brick key control visible on the timeline? you can handle it later to fix or change things right? The Variable brick can give the frame number or the time - it would be up to the user, through other bricks, to manipulate the number as required (and other inputs could be exposed in the Surfaces pane to allow adjustment without having to go back into Shader Mixer if desired and designed for). Has MatAnim been updated for 4.5? I got it and installed it in the scripts folder but it doesn't show anywhere in Studio 4.5. It shows in my 4.5. Try right clicking the location where you think it should be in DAZ Studio, and click Browse to Folder Location, to check that MatAnim really is where you think it should be. 1st) I don't understand what you mean by right-clicking a location in Daz Studio. By my understanding it should be in the tabs, but when I right-click there nothing happens. 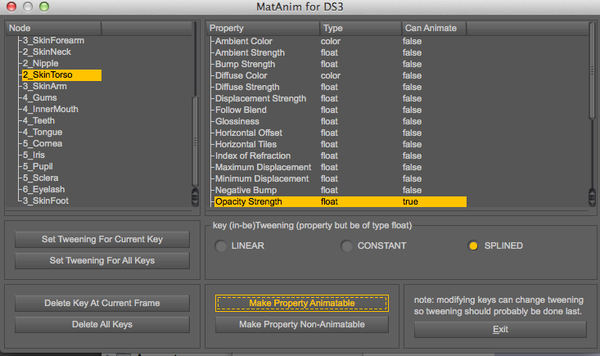 2nd) By using the ScriptIDE tab I was able to run the MatAnim script but it didn't work. The window popped up but none of the buttons would change to "animatable" when clicked. By right click, I meant right click the folder name as per the picture. 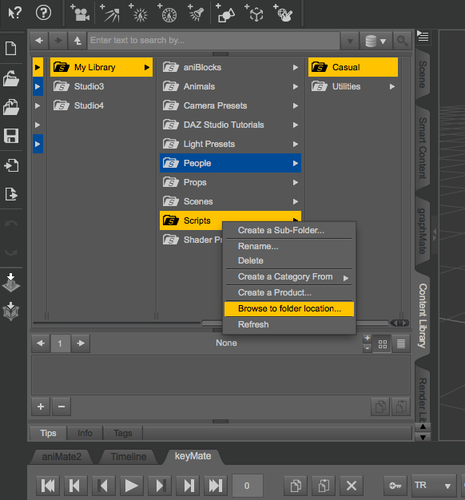 There's an option to Browse to folder location, so that you can see where DAZ Studio thinks that MatAnim ought to be. Edit: - It doesn't always work. I've sent a PM to Casual, but I don't know if the PM system is working, as there's nothing in my Sent folder. Maybe you could try too. 3. Click Make Property Animatable. And the Opacity Strength changed from false to true. I then clicked Exit. Then I selected the torso with the surface selection tool, went to the Timeline tab, went to frame 0, changed the opacity to 0. Then went to frame 30 and changed the opacity to 100. The torso animates from transparent to opaque in one second. Very helpful information. Thanks for this thread. I had just assumed Daz had this capability. But it is good to know there is a workaround. This script is exactly what I have been looking for. I want to animate the offset parameter setting of a material for an iRay magic FX prop. I could see that changing the setting resulted in the dynamic effect that I wanted to acheive, but getting it into the Timeline was the challenge. This is the answer. My test is rendering right now. Matanim is exactly what I needed! Thank you mCasual for this script, it is so useful and practical! I have no idea why my animated gif does not play.